The EventBeat team had a great time horsin’ around with the Daily Mirror at the 2016 Aintree Grand National. As a co-sponsor of the event, the Mirror wanted to increase their presence onsite using a brand activation. 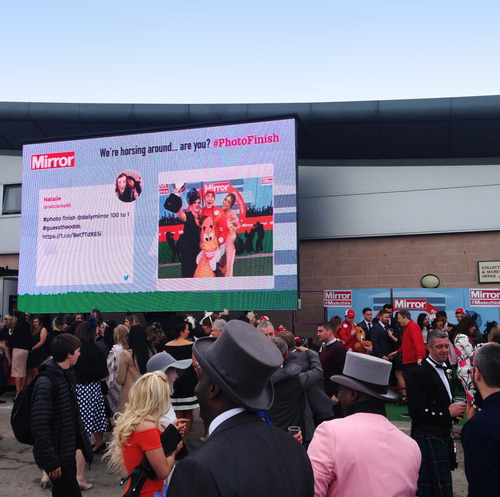 Working with EdenCancan, The Mirror collaborated with EventBeat to create two interactive experiences for the duration of the Grand National. Using EventBeat’s screen cast software we broadcast a live Twitter wall in addition to videos containing tips and competitions for each race. Visitors were encouraged to ‘horse around’ and pose for a fun photo with Grand National themed mascots then share the images online using the hashtag #photofinish. Images containing this hashtag were immediately picked up by EventBeat’s screen cast software and broadcast onto a large screen overlooking the crowd. In addition to the interactive photo-sharing, EventBeat created 7 videos for each race and an advertisement for a Guess the Odds competition using the Mirror’s tipster, Newsboy. A frequent issue with large events is the interruption of transmission due to an overcrowded internet signal. In this instance EventBeat was able to use a 4G booster to maintain the screen signal throughout the 3-day event with no issues, this ensured 100% uptime of the screen display. By the end of the Grand National hundreds of Tweets using the promoted hashtag were posted during the 3 days, with EventBeat moderators approving 261 of those to go on the large screen.